March 6, 2017 – This week, our time machine travels back to the earliest days of the United States, to what’s sometimes called the Second War of independence: The War of 1812. For the first time in this fight against Great Britain, Congress used the Constitution’s power to declare war, and for the last time, the men doing the fighting supplied their own weapons — an idea that seems incredible today, where the term “militia” itself is given very different connotations than national defense. 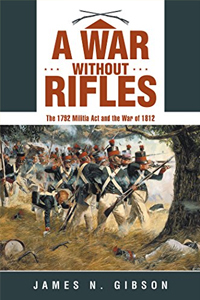 Our guest is James N. Gibson, and his book is, A War without Rifles: The 1792 Militia Act and the War of 1812 . Mr. Gibson was born into the U.S. space program through his father, and is himself an Aerospace Engineer. His resume features time with such giants in the field as Boeing and McDonnell Douglas, as well as work on the International Space Station and Space Shuttle programs. His previous books include Nuclear Weapons of the United States: An Illustrated History , and The Navaho Missile Project: The Story of the “Know-How” Missile of American Rocketry . You can learn about these and his other works at JNGibson.com, or follow him on Twitter @JNGibson55. And for more on the War of 1812, catch our interview with John McCavitt and Christopher T. George, co-authors of, The Man Who Captured Washington: Major General Robert Ross and the War of 1812 .